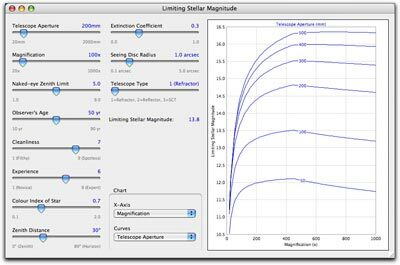 LimitingMagnitude is a small application that implements Bradley Schaefer's limiting stellar magnitude algorithm with a visual interface. This is based on the article in Sky & Telescope, November 1989, p 522 - 525. Please report any bugs, anomalies or feature requests to Paul Rodman. 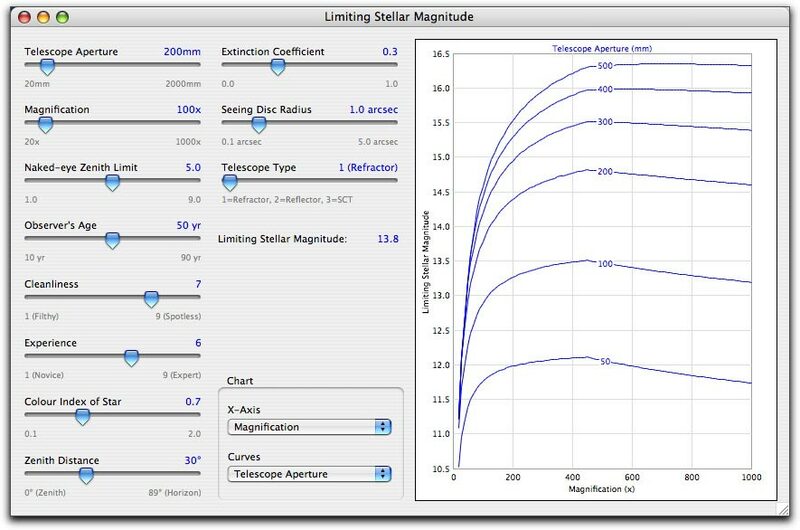 LimitingMagnitude is Freeware. Use it at your own risk. If you would like to support my astronomy obsess..., er hobby, and feel this application has some value to you, I always gratefully accept donations. Creating software like this requires lots of time and expensive software and equipment. Note: Although LimitingMagnitude is freeware, please do not post the files anywhere else without permission. Feel free to point anybody at this page or publish the URL publicly. * Your browser should take care of retrieving this file. If you end up with a file having a ".hqx" suffix on its name, try dragging it onto Stuffit Expander. ** TARed and GZipped (.tgz). Required: Linux SuSE 8.1 or higher, Red Hat Enterprise Linux 3 or higher, Mandrake 8.1 or higher, or any other x86-based Linux distribution with GTK+ 2.0 (or higher), Glibc-2.3 or higher. *** This is a ZIP file. You can uncompress it with one of several utilities. We recommend WinZip. If you have problems downloading these files, let us know and we'll e-mail you a copy.